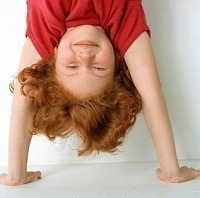 Success with first grade sight words will turn your child's reading and spelling world upside down! Give your student every possible advantage by providing lots of practice with these essential words. Find lots of Sight Words Lists on our site. We have both the Dolch and the Fry words for your convenience. The first set of sight word flash cards is for quick-reading practice. Here's a screen shot of some of the flash cards. The printable set contains more. 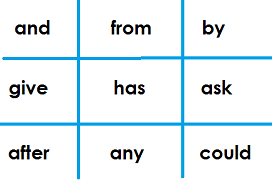 The second set of sight word flash cards is for early-learning spelling practice. These are the same words used in the set above. In most words of 3 or more letters, one letter is missing. Here's a peek at a few of the flash cards. There are more in the printable set. Many young students need lots of practice to master basic sight words. 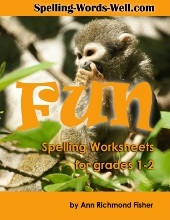 Here are just a few of the games, worksheets and activities on our site. Use the tabs on the left to find more! Here are just two of the games you'll find in our Sight Word Games collection. These games will show you and your students that learning the basics can be fun! Visit our collections of phonics activities and phonics worksheets for more helpful resources. 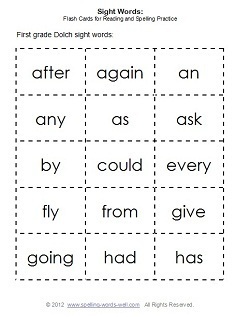 Our page of kindergarten sight words and activities contains ideas that will work with first graders, too! Working ahead? 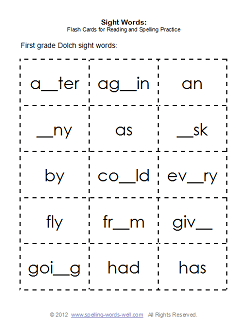 Use these flashcards for Second Grade Sight Words and Third Grade Sight Words.